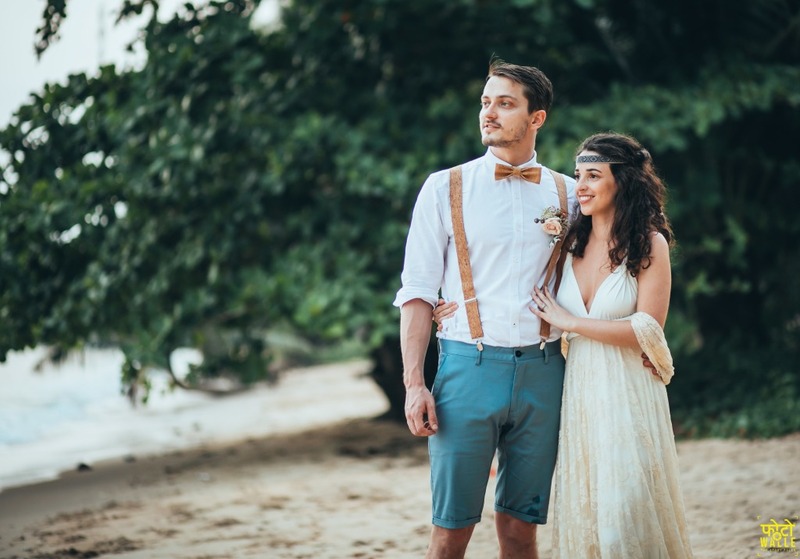 Today I want you to know Ana and Rait’s bohemian destination wedding on the beach, one of my favourites weddings until today without any doubt. But I want to tell you something first. Many of our Mimètik brides tell me about how lucky they feel for having found a wedding dress that define them as they are, with which they feel authentic and naturals. But, sincerely, it’s the other way round; I am the lucky one for designing your wedding dress. I am very fortunate to be able to participate in such a special day like this, and I’m even happier when I receive photos of couple as in love as Ana and Rait are. 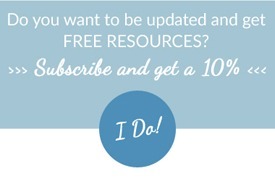 That’s why I like so much to share our real weddings in the blog, it’s my way to thank so much trust in me. As I was saying, today I bring you another of these fantastic stories. 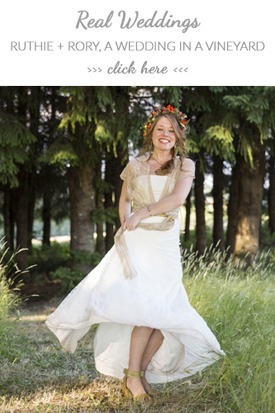 If you like relaxed weddings, surprises and Vikings, you have to read this story! We can say that Ana and Rait’s story is everything unless monotonous and boring. Theirs is a love without borders and super international! You can count yourself all the countries that appear in their story! You will realize that borders really don’t exist for this love. For what Ana has told me, I think she and Rait are a perfect example for a couple that understands perfectly between them, who are complemented and, above all, who respect each other. They both have a very similar vision of life. They are a great support for each other and have a very relaxed way of life, with sofa, TV, football and wine evenings. Without many pressures and with a great passion: travelling. Ana tells me that they usually travel every one or two months, wow! How lucky! I’m also a lover of the world and I travel whenever I can. 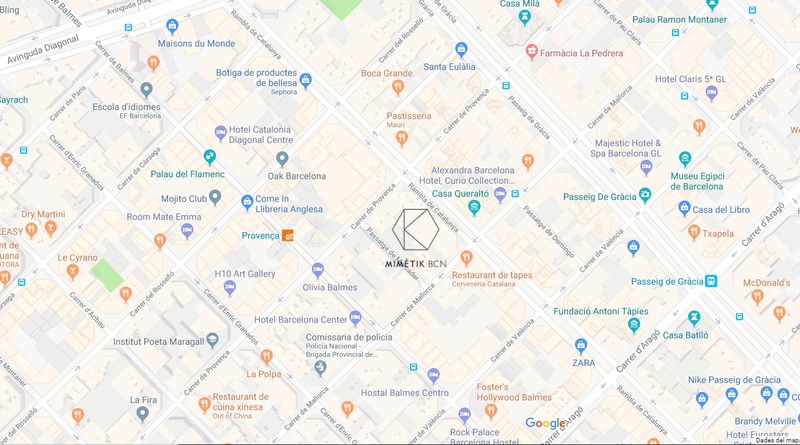 In fact, Mimètik Bcn was born of my fascination for different cultures of the world, as I told you in my first post. The way in which Rait and Ana were engaged could be summed up in one word: “epic“. Rait decided to bent down on one knee in a big way, with a proposal on the Estonian TV with a viking theme. Yes, yes! As you hear it! Rait went to the program “Tule mulle naiseks” on July 2016 to declare her love in a very special way to Ana. So they tricked Ana by telling her that she was going to a SPA with Rait and some friends, when they suddenly decided to pick a man who was hitchhiking on the road. The man guided them to a viking village, which would be the scene of the proposal. There, they dressed Ana as another viking girl and recreated the tradition called “stealing the bride”, where two sides of the village have to fight for the bride. Ana had no idea of what was going on, she though they took the wrong girl! 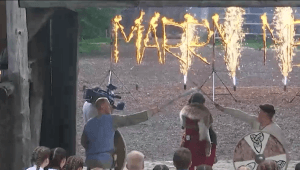 Until, finally, Rait appeared, also dressed as a Viking, and with some letters on fire behind him where you could read “Marry Me”. What a beautiful and original proposal! Personally, I’m totally in love with this theme. I find their history, traditions and culture in general super interesting. If you are also fascinated by vikings, I recommend you to take a look at the post I wrote about hairstyles for your wedding, where I recommend the viking braids for brides “medieval princesses with a touch of rock”. Total! And, of course, after such an special story, the wedding day couldn’t be less! The date was March 27th of this year, and first, they had to decide where the wedding would take place. And what’s better than to combine one of your most special days with your great passion, which is traveling. 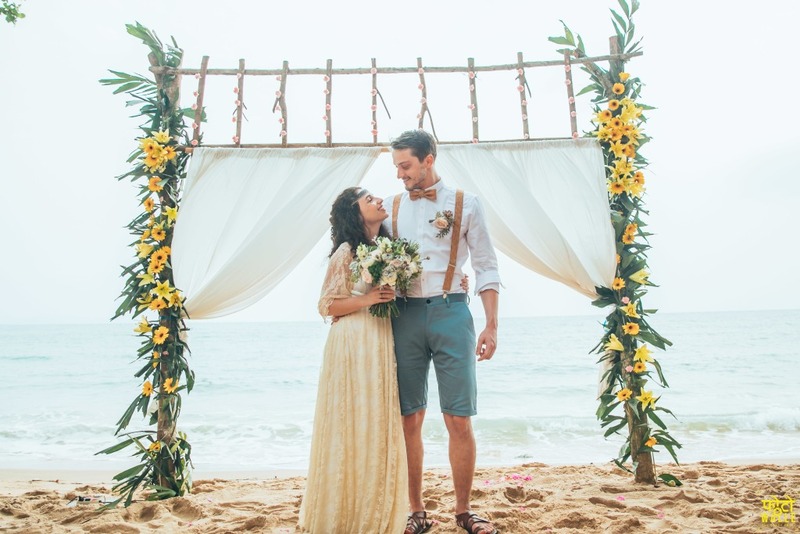 Ana and Rait decided to get married in Vietnam, a destination wedding, in a resort called “Bamboo Cottages in Phu Quoc”.The owner wasn’t very interested in having weddings in his propriety, but as Ana tells me: “it was his sincerity that made us see that it would be the perfect place for the ceremony”. And so it was, since as we can see in the fantastic photos of Fotowalle that illustrate this post, it’s a beautiful place. The wedding was attended by 30 guests from all over the world: Portugal, Brazil, Estonia, Switzerland, United Kingdom and even Australia and India! And, although not everyone understood each other, Ana and Rait’s friends were doing simultaneous translations of the ceremony. One of the things that I like most about this wedding is precisely this naturalness, the fact that everything was done between everyone. 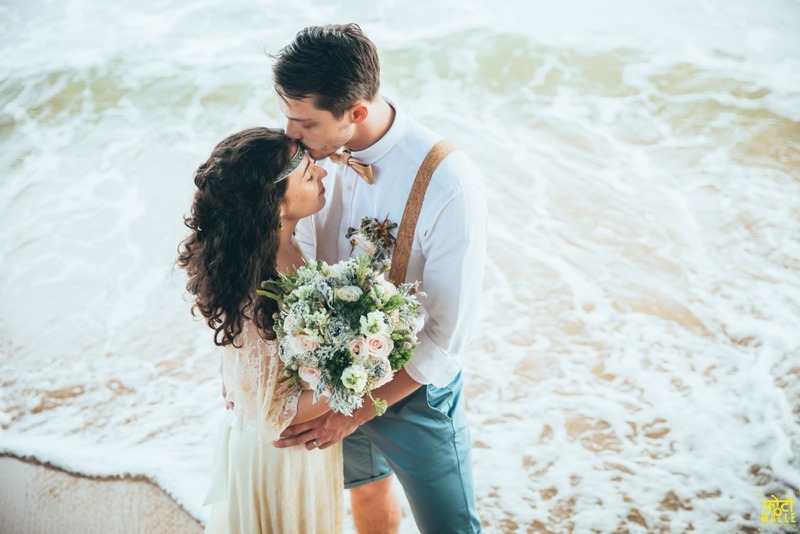 You know that handmade weddings are my favourite, I think it’s a great way to make a union and that everyone participates in the ceremony and thus create unforgettable memories of a beautiful rustic wedding on the beach. In Ana and Rait’s wedding everyone did something. 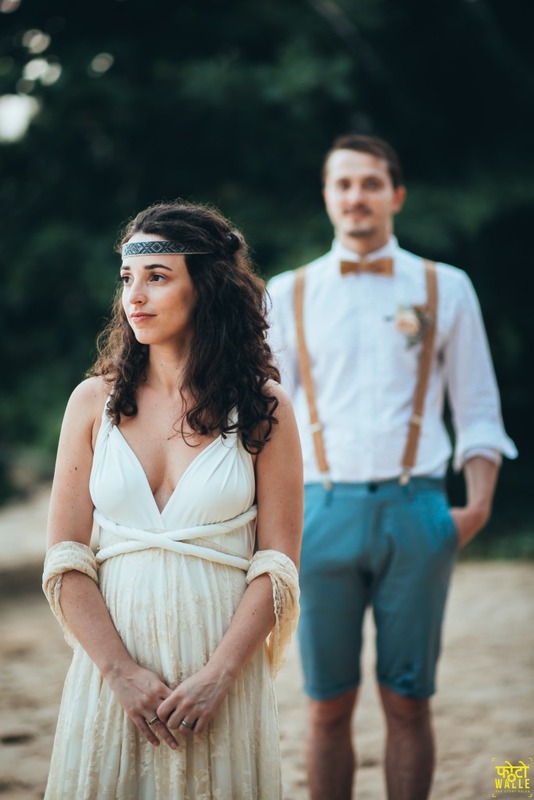 From organizing the wedding, playing live music, taking pictures, styling and making up the bride… and even officiate the wedding! 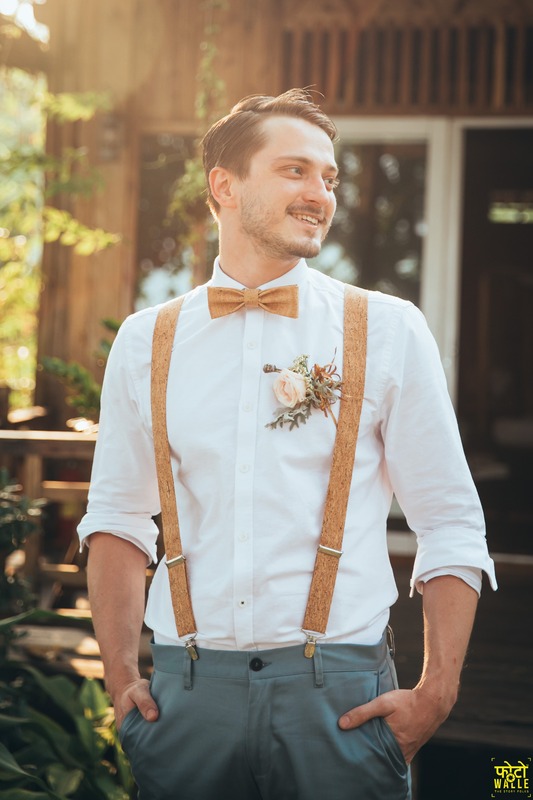 Rait’s brother was the one who married them, and let’s say he even dressed for the occasion 😉 In addition, because of so many nerves he had, he inadvertently deleted the speech he was going to give to officiate the ceremony just before he started, but it did not matter, as everyone had a great time and it was a perfect wedding. To end the night, the Ana and Rait ‘s friends had prepared a lot of games to have fun, and I think it’s a great yay, it’s always nice to have a good time! 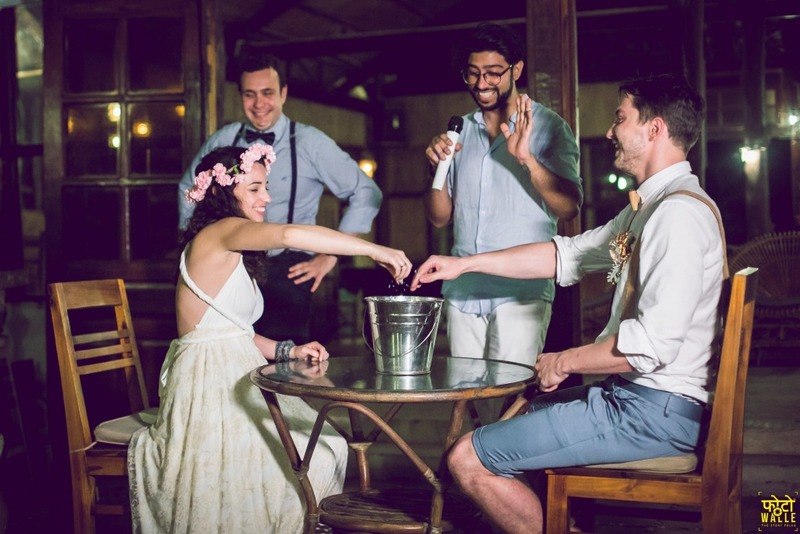 If you are also thinking about adding games to your wedding, don’t miss the next post I am preparing for the blog, I am collecting ideas of games and activities for your handmade wedding. Subscribe and I will let you know as soon as I have it. You’ll love it! I really love that Ana chose Mimètik Bcn for her wedding dress, because her story seems very special to me, and I love being part of it. As you have already read, Ana isn’t one of those people who is overwhelmed and cares about everything, she just goes with the flow, and I love this way of seeing things. 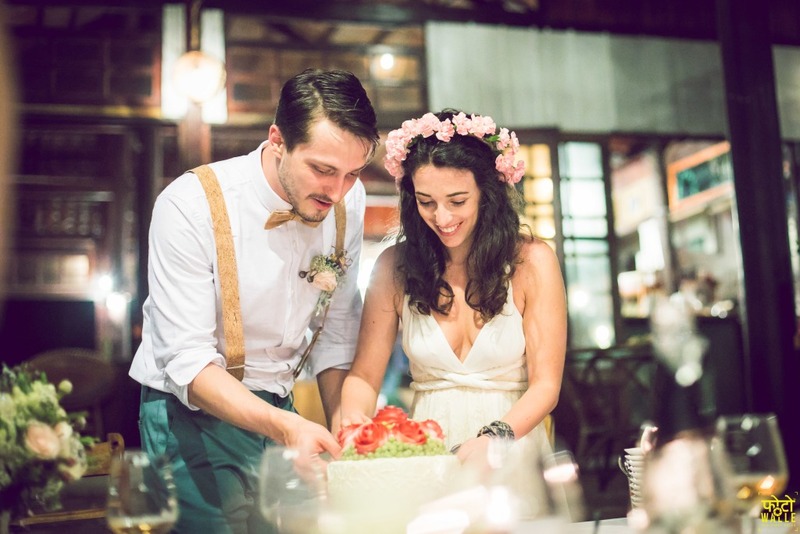 From the beginning she knew that she wouldn’t go all over Budapest to buy a wedding dress, so she decided to look over online: and that’s how she Mimètik Bcn, and what would be her wedding dress. Ana decided to ask for some bridal samples in order to see and touch the materials, and also to be able to consult it and ask some friends for advice. 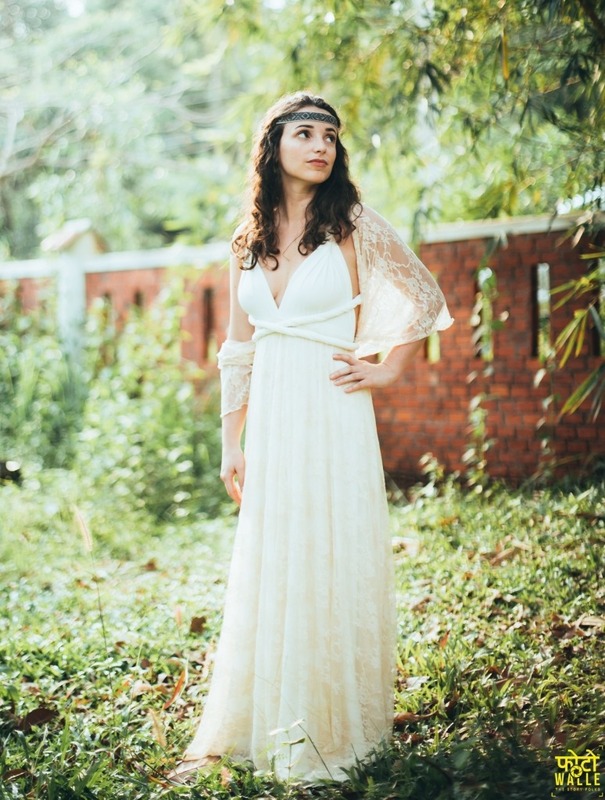 And finally she was spectacular with her Gala Rustic dress with champagne lace, and, as she also complemented it with a champagne lace shawl, it looked so beautiful on her. In addition, she and Rait decided that he would wear Portuguese cork accessories and Ana would get some complement related to the Estonian culture. And both were beautiful! 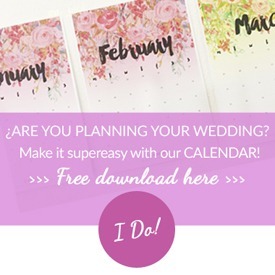 I’ve never dreamed of my own wedding and I started to plan it very close to date, but I believe that it doesn’t matter if you have always dreamed of it or you started to think about that idea not so long ago – do only what you want to do. No matter what people think or will say. It should be your choice to have the ceremony you want, the dress what you want and invite who you want. Most weddings are about pleasing the guests and that shouldn’t be it. Such a wonderful wedding! Thanks to Ana and Rait for sharing their story with me, I wish you all the best in your journey together, and if your new life is half fantastic that your story is so far it will be so great to you ♥. 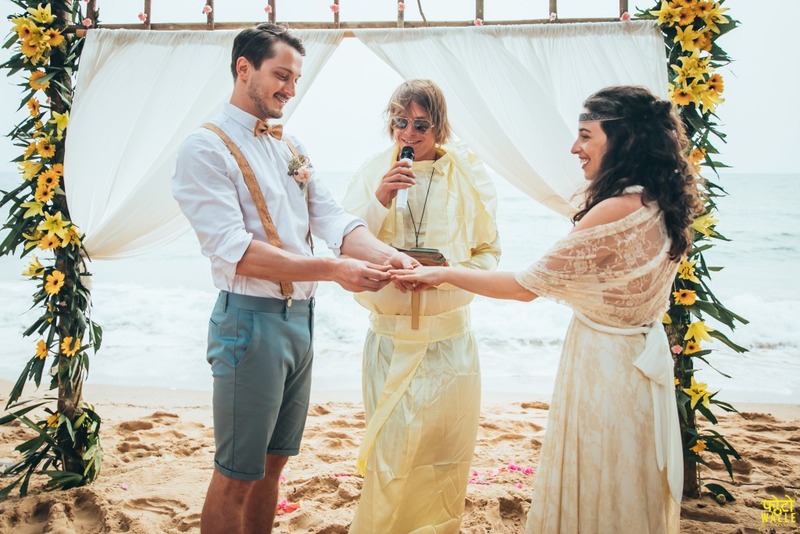 Did you also have a bohemian wedding on the beach? 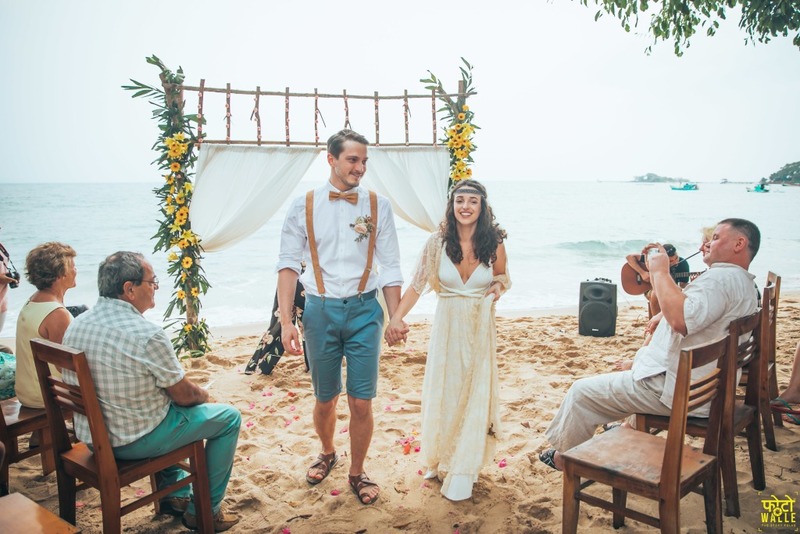 Did you marry in a destination wedding in the other side of the world? Tell me in the comments! 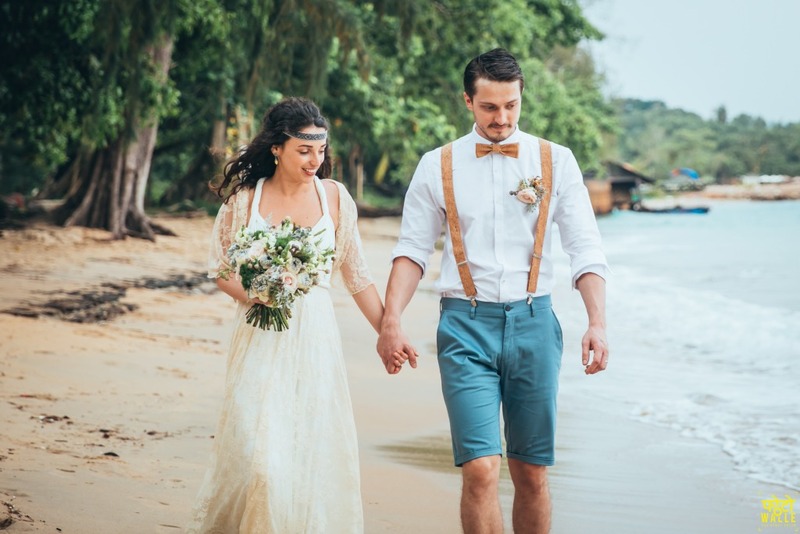 This entry was posted in Blog, Real Weddings and tagged beach wedding, boda bohemia, boda destino, boda real, boda rustica, bohemian wedding, destination wedding, real wedding.